We can't let Bastille Day go by without some culinary homage...and what better way to celebrate than with cake! Combine flour, cocoa, butter, pecans and sugar and work to a soft dough. Press mixture into a well greased and lined circle crust tray (about 28x18cm). Bake in a moderate oven for about 15-20mins. Leave to cool in the tin. Melt the chocolate and allow to cool. Cream the butter and sugar, add eggs, one at a time, beating well. Stir in the chocolate and raisins and beat well. 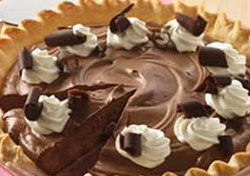 Spread chocolate mixture over the crust and chill several hours. Whip the cream, gently fold in the cream cacao. Carefully remove chilled crust mixture from the pan. Cut in half lengthways. Place one half, crust down on serving plate and spread with half the whipped cream. Top with other crust, crust side down. Spread or pipe into decorative circles with remaining cream and decorate with chocolate shavings. Freeze the cake. Slice while frozen. Stand at room temperature before serving.